Re-inventing the wheel isn’t an easy task. Many companies try and try to bring a product to market that completely redefines the standard of a given item, and fail. So when a company actually comes up with something that brings about considerable increases in user safety, ease of use, maintenance, weight savings, and increased portability over a long-accepted standard you have to spend some time with this new item to see how it really compares to the old standard. 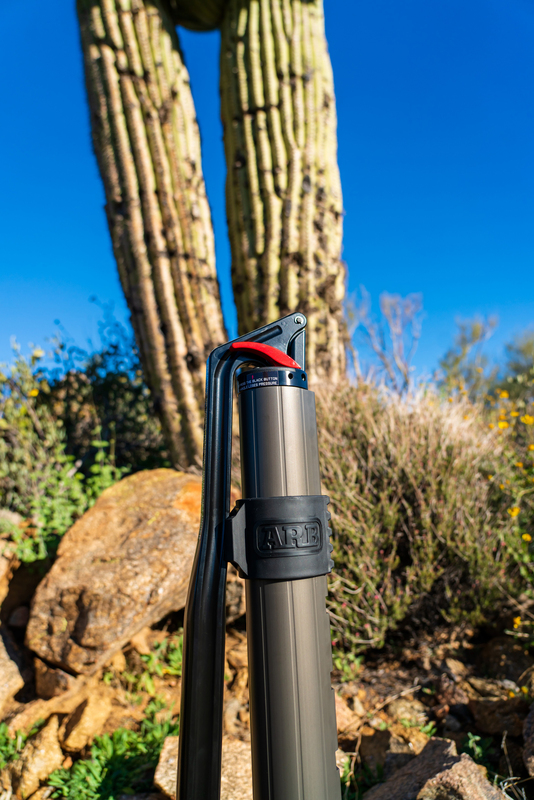 In this case, I’m happy to report that ARB has come up with a worthy successor to the Hi-Lift jack – and they’ve named it after one particularly rugged and dapper looking fellow. Meet JACK. 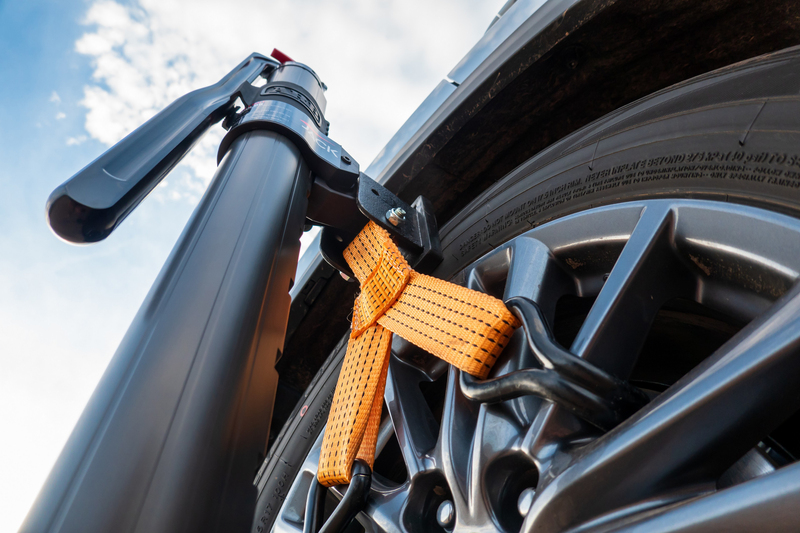 Using a Hi-Lift can be the clutch tool you need to get unstuck, but they’re also tools that can seriously harm you if you fail to respect the forces associated in using one. 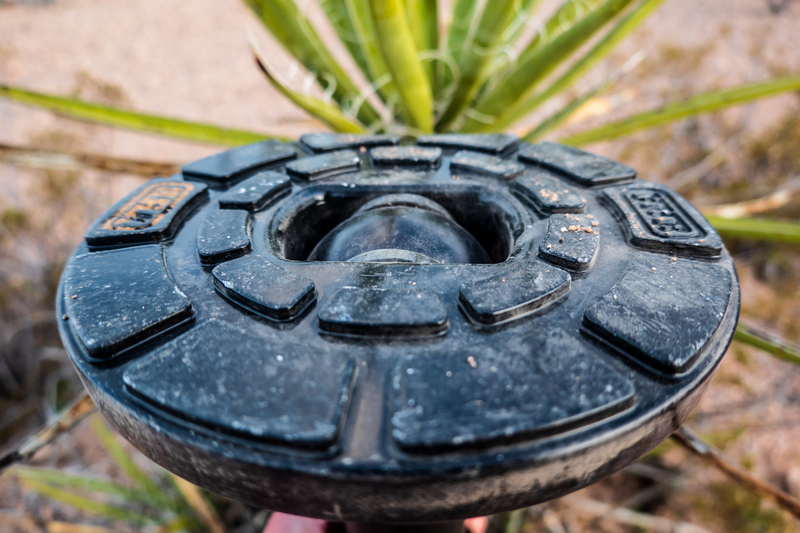 A Hi-Lift uses mechanical means to raise and lower a load, and as such has a number of places to pinch, smash, and otherwise impart damage to your body. In a lowering situation, the lever arm can runaway from the jack operator and turn into a body-smashing runaway arm. Google “runaway Hi-Lift” if you want to see what I’m talking about. Yet for all their faults, Hi-Lifts have been getting folks unstuck for decades, because they work well in all kinds of situations. So ARB’s JACK has to bring some serious advantages to the table to compete with the tool that’s been king for over 100 years. Regular maintenance and training can mitigate many of the risks associated with using a mechanical jack. Yet taking these risk factors out of the picture all together is a better solution, which is exactly what JACK does. JACK uses hydraulic power to raise and lower a load, which means that the steel standard bar, runner, steel handle, and all the effort required from the operator to use a mechanical jack, are replaced with a lever that requires a fraction of the effort to operate. 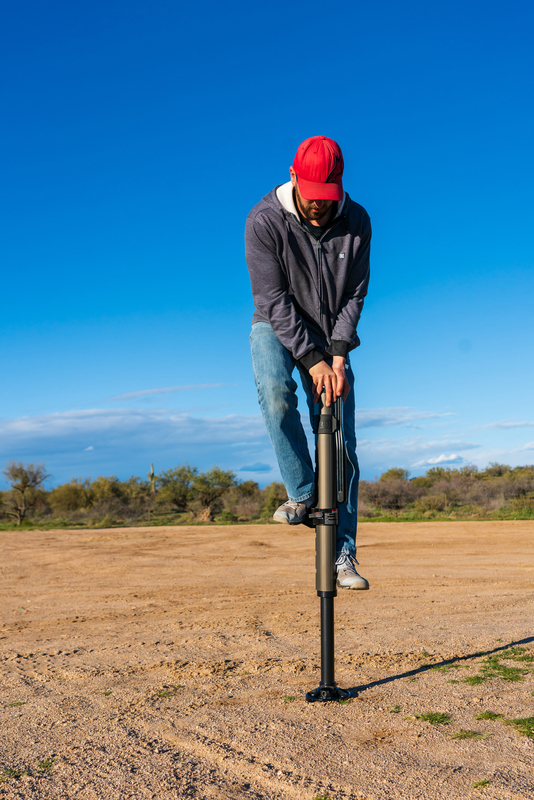 To raise a load, simply pump JACK’s lever and watch hydraulic power do all of the work. When it comes time to lower the load, simply press the red lever to engage one of two circuits; a high speed and low speed depending on how quick you need to lower said load. 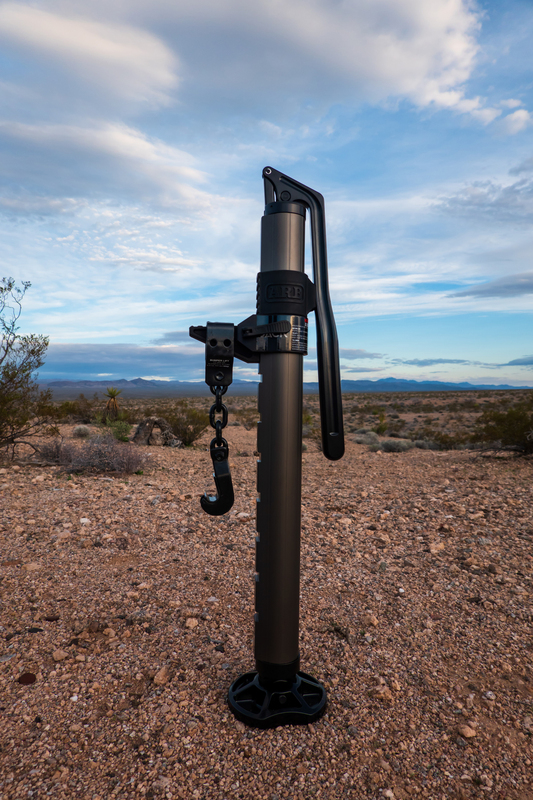 Folks who are lightweight will really appreciate how much easier it is to use JACK to raise and lower a load compared to a Hi-Lift jack where the operator is the weight imparted on the lever that causes the Hi-Lift’s running gear to climb or descend the standard bar. 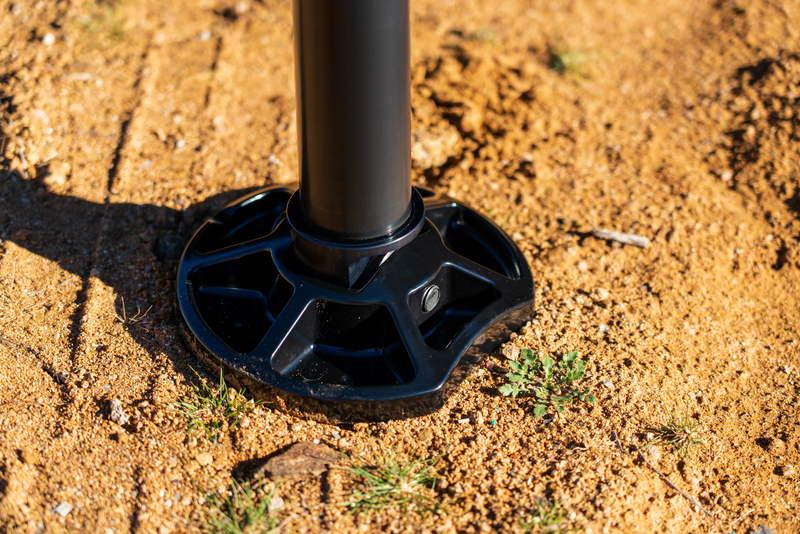 JACK also lets you make much more finite and precise adjustments to load height, as opposed to the Hi-Lift which is limited to the spacing of the holes in the standard bar. Then there’s the weight and packed size of JACK to consider – JACK may look big and imposing in photographs, but he packs up to a compact 36 inches long and weighs in at 23 pounds which is roughly 7 pounds less than a 48-inch top-shelf Hi-Lift. 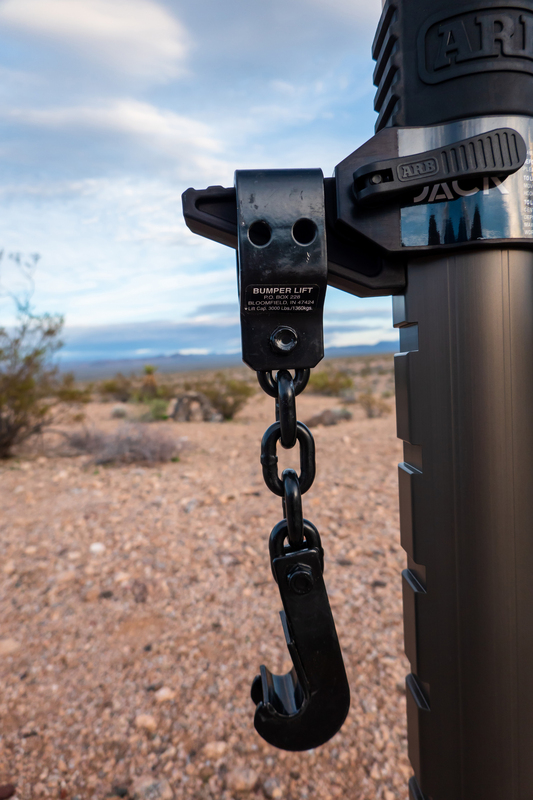 When it comes to lifting loads, JACKS’s body has nine notches where you can position the tongue to interface with your load, which leaves the piston stroke for actually lifting the load. 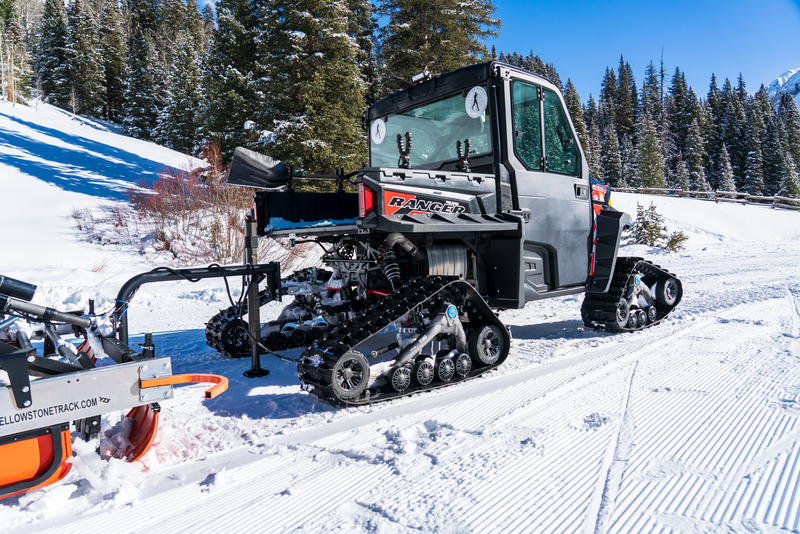 In terms of packed size, a 36-inch Hi-Lift will top out at 22 inches, while JACK can go all the way to 48 inches. 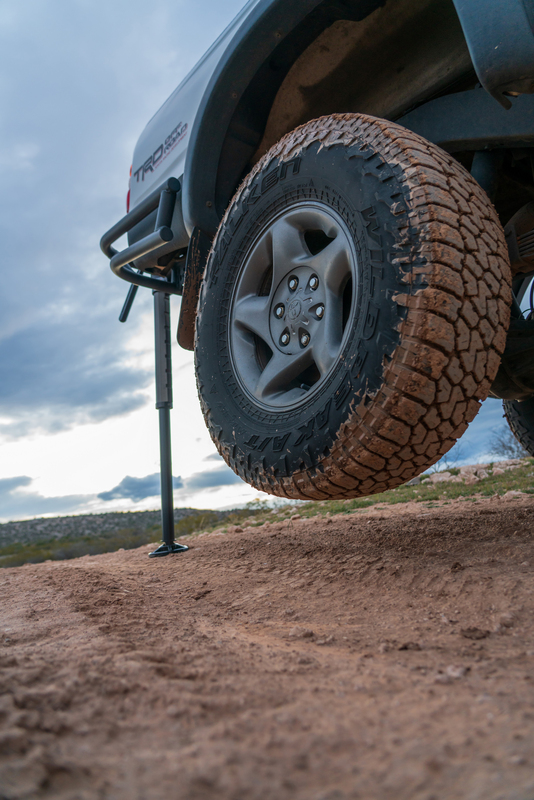 Likewise, a 48 inch Hi-Lift will top out at 34 inches, and the 60-inch Hi-Lift will get you 46 inches. 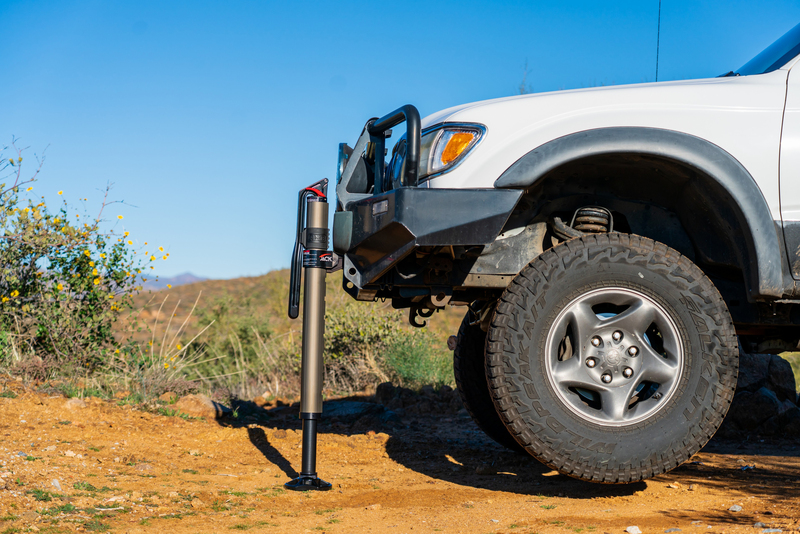 It’s important to note here that a Hi-Lift can run its entire range (length of standard bar) in one go, while JACK is limited by it’s piston stroke of 21-22 inches. 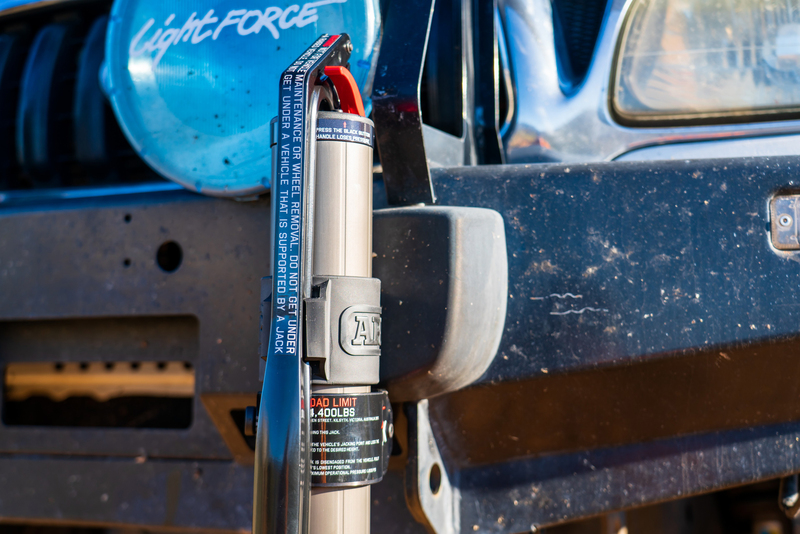 If you’ve taken a class on advanced Hi-Lift technique, you’re aware that a Hi-Lift can winch, clamp, and spread, which are things that JACK would be unable to do without modification or some ‘solution-engineering’, so be aware that JACK only lifts, it does not provide power in both directions to clamp and spread. Folks who are well-versed in Hi-Lift will also key-in on the fact that a number of tongue-mounted accessories that work with other recovery devices will also work with JACK. I need to point out though, that if you try and use such accessories, that you can’t blame me if your improvised solution fails and someone gets hurt. 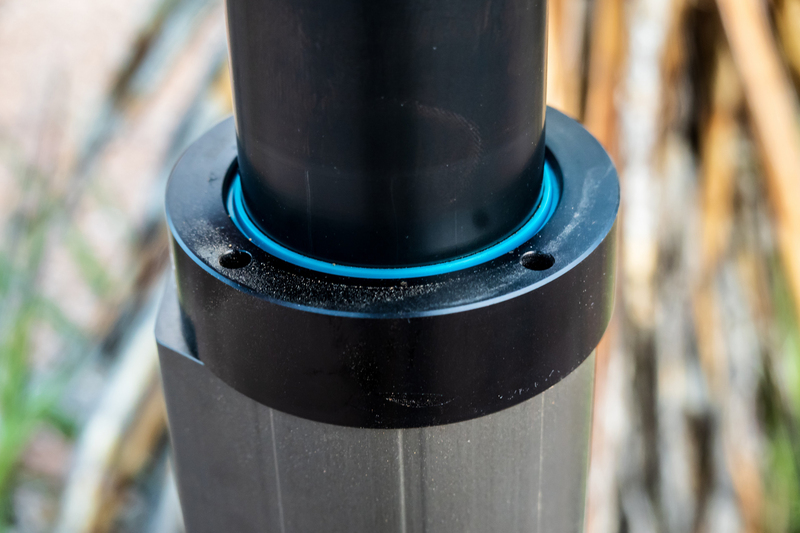 JACK has eliminated a number of risk factors over a Hi-Lift jack, but the fact that you’re still lifting thousands of pounds from a single point means that significant risks still exist. Yet, JACK isn’t without fault. You can still smash a finger on the lever (prevent this by pushing with an open hand, like you’re pushing a wrench), and operationally speaking you’ll find that lowering the running gear on your Hi-Lift is much easier that compressing JACK back to his storage size when you don’t have a few hundred pounds of load to fully compress the piston. So how do you compress the piston when your load is back on the ground? Well you make a game out of it – essentially what you need is weight to compress JACK, so stand on the tongue and start balancing while holding down the red lowering lever. If you’re good, you can get the piston fully compressed without having to dab for balance with your other foot. If your balance isn’t so good, have a friend help stabilize you while you’re JACK-standing. 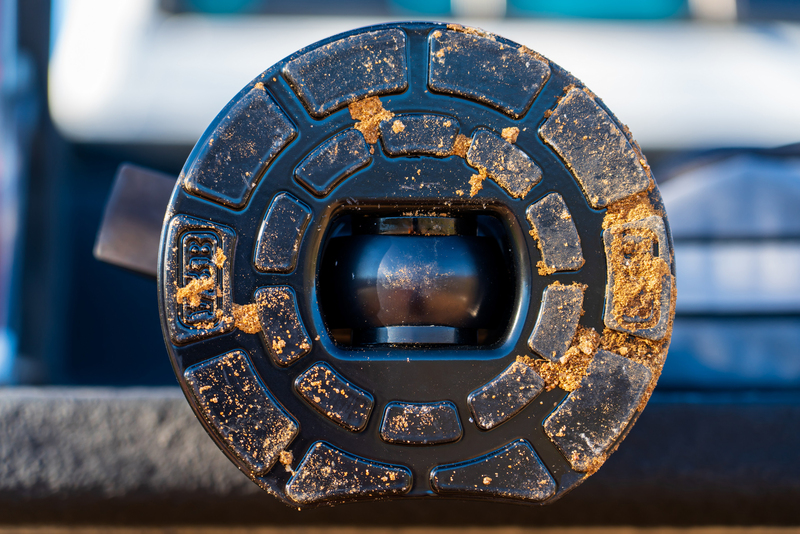 While you’re balancing precariously on JACK, take a second to appreciate the JACK’s foot, which thanks to a beefy ball joint, is actually EXTREMELY stable. 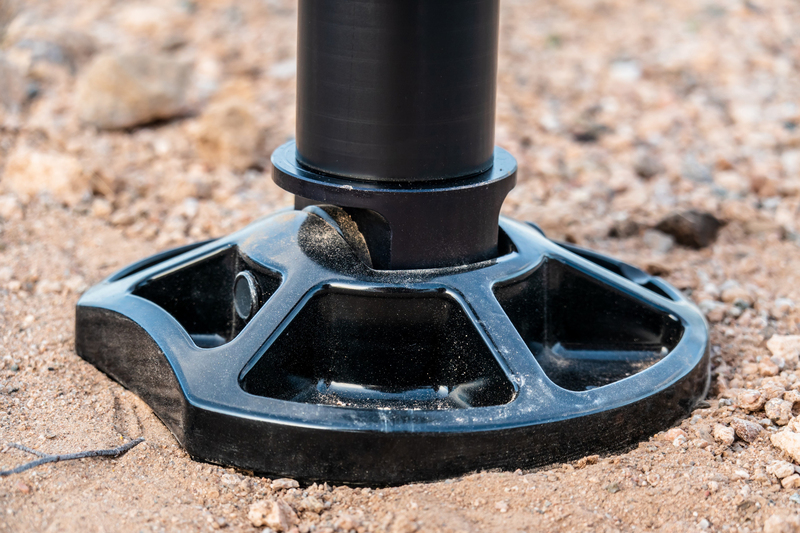 Yet, the foot can still sink into the ground if you try and lift a heavy enough load on a soft enough surface, so you you may need something to distribute the load further when working on soft surfaces. 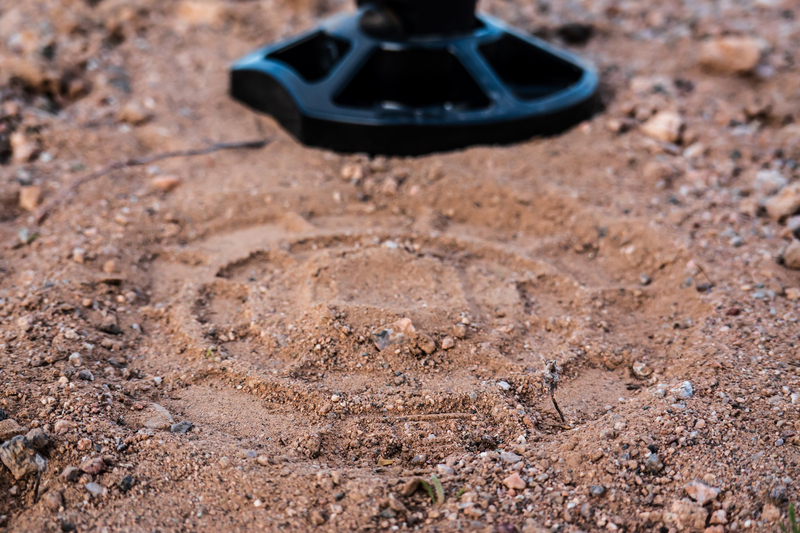 JACK’s base also leaves an impressive ARB brand on any surface it can compact slightly, so don’t be surprised if someone starts offering “your brand here” bases for these things, because overlanding. Yet compressing JACK’s piston isn’t the biggest piece that needs addressing – it’s the price tag that is going to be the challenge for JACK. With a quick Google for ARB JACK turning up prices around $775 USD, this isn’t a small purchase – so let’s think about this by considering some alternatives. 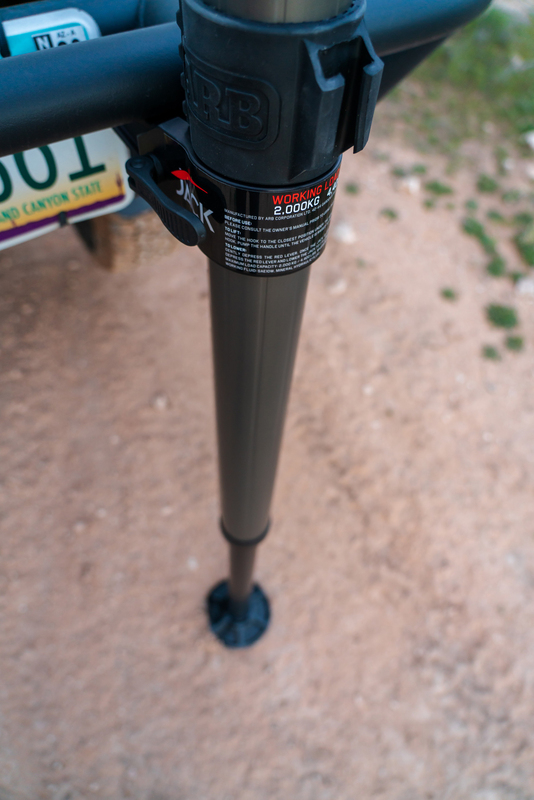 On one hand, you can buy a Hi-Lift for a fraction of the cost, and if you take care of your Hi-Lift and learn how to use it, there’s no reason it won’t take care of you. 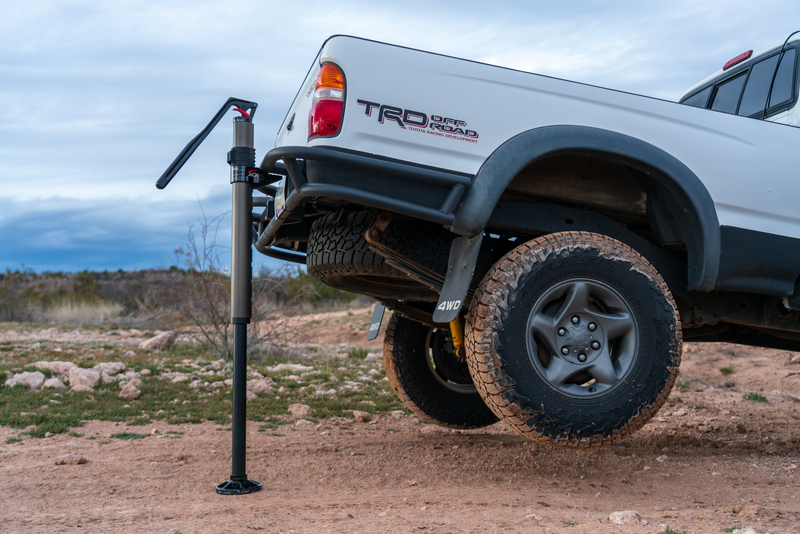 But, let’s say that you don’t really take care of your Hi-Lift, or maybe you like it, but don’t want to pay for training by an I4WDTA Certified Trainer on how to use it correctly. And then, one day you get to experience a run away Hi-Lift. Depending on how bad the Hi-Lift gets you, $775 could be a steal compared to what an EMS response would cost you. But please, don’t think that high quality training or buying JACK makes you invincible – you’re still playing with thousands of pounds of force and working against gravity. Off road recovery isn’t cheap, and while I’ve never had the privilege of footing such a bill, I do know that it’s easy to spend a four-figure sum, so a three-figure recovery device sounds like a better deal to me if it means you’re going to have said tool with you, instead of leaving your Hi-Lift at home because it’s too big, rattles too much, or destroys your vehicle interior. 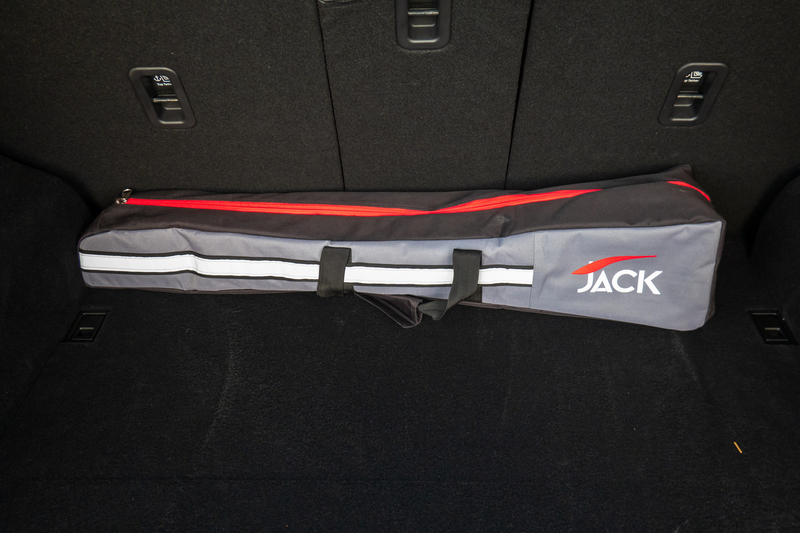 JACK does pack up small and rides quietly, and the included bag means it can ride inside any vehicle without trading paint with your interior. 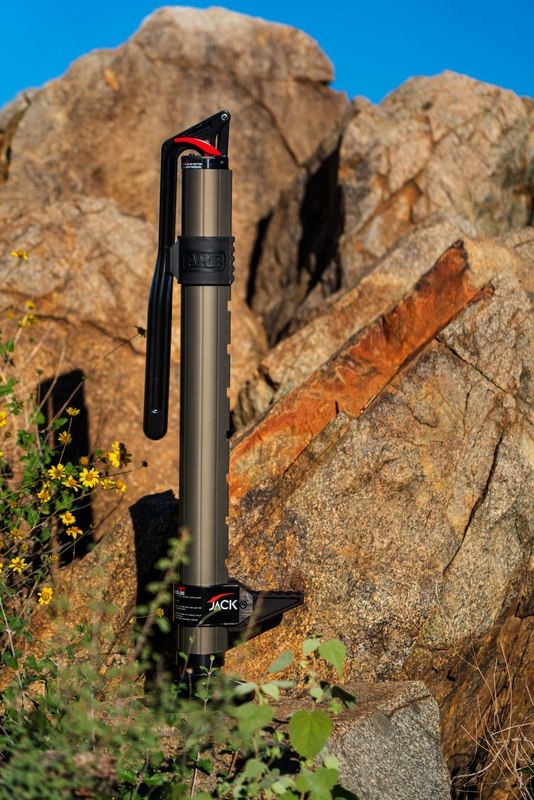 Hopefully, this means you’re more inclined to bring it with you on your adventures. 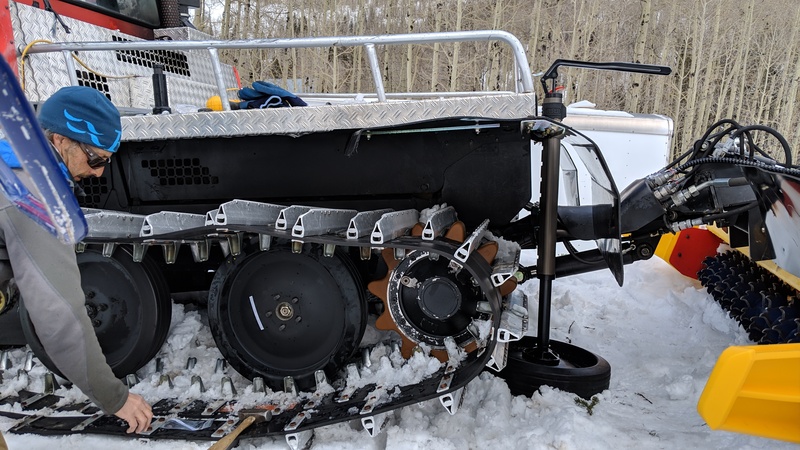 Even when you’re not in a recovery situation, JACK can prove to be quite handy for work, such as when you’re trying to lift a grooming implement up so that you can hook it up to your Ranger with Tracks, because letting JACK do the work is way better than letting your back do it. I know this is a random example, but stick with me. This is something I’ve considered doing with a Hi-Lift for years, but I’ve never felt quite safe doing it. Yet, JACK is easier to use and stable enough that I feel comfortable using it to lift this implement – and my back is quite happy to not have to make that lift. I have to hand it to ARB – they’ve succeeded in reinventing the wheel, or the high lifting jack in this case with JACK. 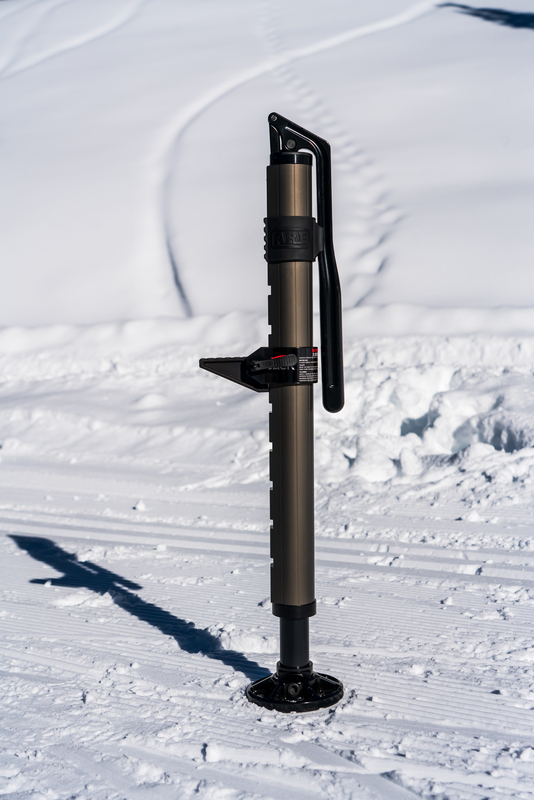 Yes, its going to cost you a pretty penny up front, but you’re getting a safer, easier to use (especially if you’re a smaller or lighter person), easier to transport option for a tool that’s been the standard for a very long time. As mentioned, JACK can’t winch, or clamp, or spread, but I’d wager that with some clever thinking, a good recovery kit, and a solid understanding of physics, you could employ JACK to do just about anything. 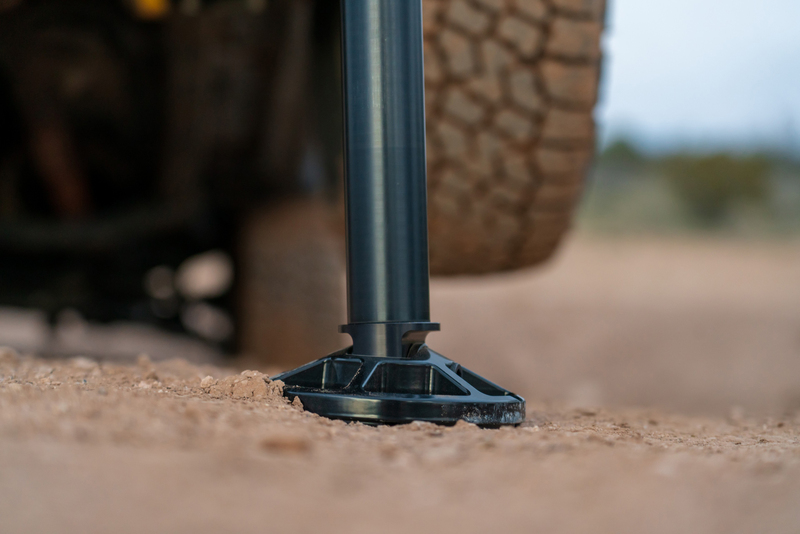 Aside from the limitation of the piston stroke (with is more than enough stroke to lift the vast majority of vehicles that will carry JACK), the ARB JACK can lift higher, pack up smaller, and weighs less than a Hi-Lift. There’s less maintenance, and cleaning JACK is as easy as wiping it down. The fact that JACK lives in a case inside your rig means that it’s not going to let you down due to rusting or getting gummed up with dirt and debris, and you’re never going to have to improvise some form of lubricant to get the thing to work. The upfront purchase price of JACK is definitely something to consider, but in the time that I’ve had JACK, I’ve put it to use many times and found real value added in it’s ease of use and safety factor. So I can confidently say that JACK pays for itself in short order. 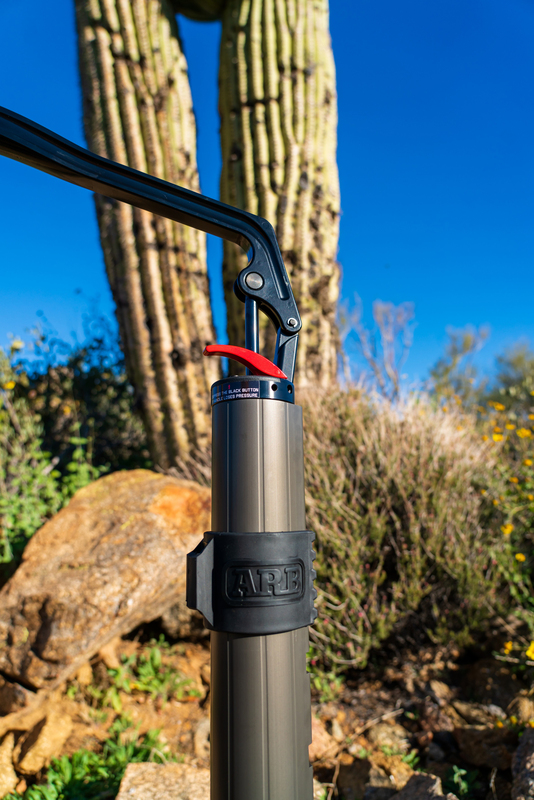 Full Disclosure: ARB USA provided a JACK on loan for an independent review by American Adventurist. Looks a lot safer than a Hi Lift but at a 3 pound weight savings and a pretty large price tag. Doubt I will get one as my Hi Lift has been left in the garage for years. Great write up on the jack. Only because of Overland does this jack exist. Insanely expensive and can only lift. Actually it's a seven-pound weight saving, which equates to 25 percent. 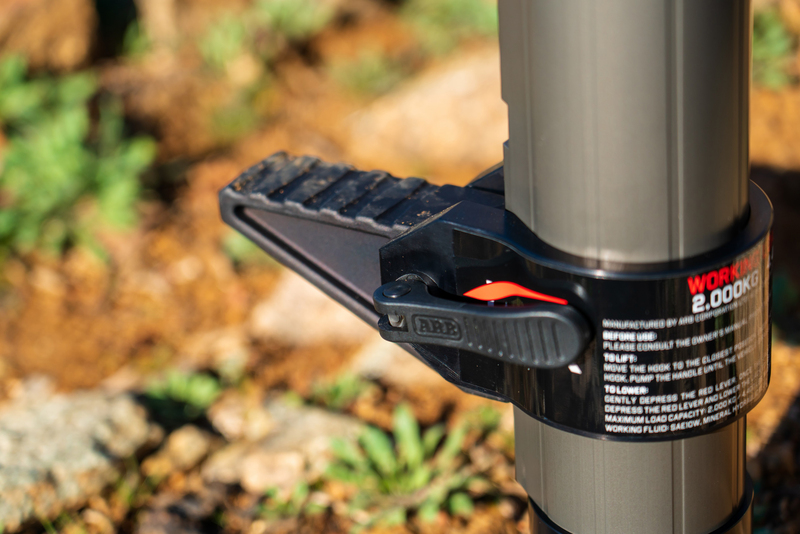 I measured the difference directly when I tested the ARB Jack in Australia. Personally I was impressed with it, and—if price were no object, an important point—would unhesitatingly choose it over the Hi-Lift. As to the Hi-Lift's ability to winch, clamp etc., I know how many times I've actually used it that way outside of showing students it can be done: zero. The ARB is massively superior to the Hi-Lift in its primary function: jacking. Lifting effort is reduced hugely, lowering effort does not exist except in your index finger pushing the lever. 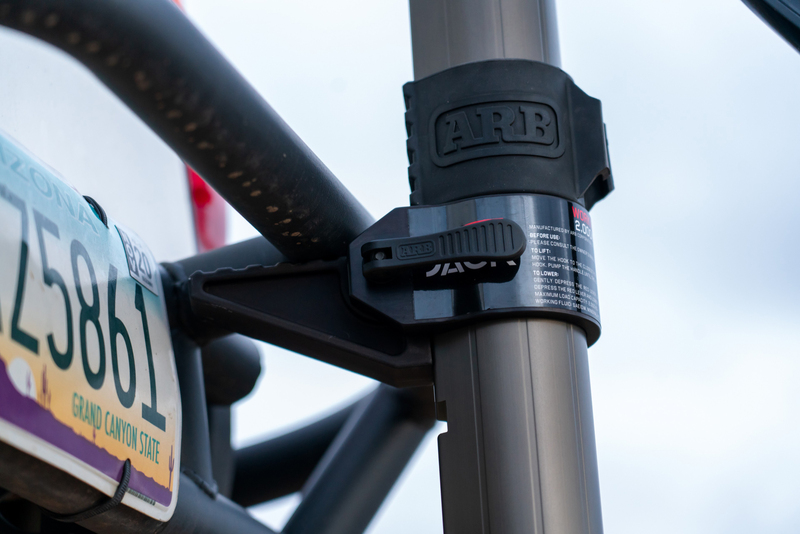 Handling and storage are easier since the ARB is only 36 inches long stowed. Increased safety is a given, and impossible to quantify in dollars given the injuries I've seen personally from a second's lack of concentration on Hi-Lift operation. So dissing the ARB on function is futile as far as I'm concerned, and it's certainly not a "joke." As to the price—that's a fair target, and I think only sales figures will tell whether ARB knew what they were doing when they stuck the tag on it. In these days of $2,000 fridges and $1500 driving lamps, I'm not sure it's that big of a leap. Yes, 7 lbs lighter is correct and yes, we are impressed too. I'm also in the camp of "if price were no object", and "never used" the clamping or spreading feature on a HiLift outside of classroom style demos. It's really hard for me to NOT carry a HiLift. 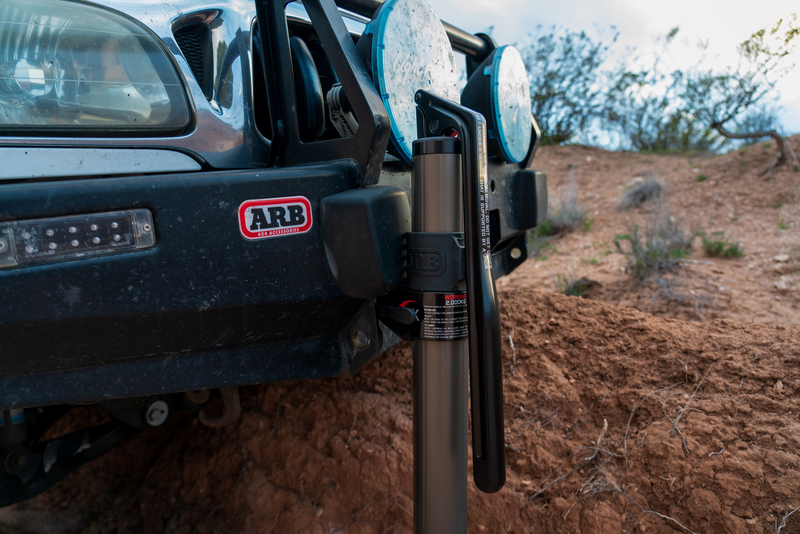 That said, the ARB Jack is a very nice piece of equipment. Great job on the unfettered write up guys. We will also note, outside of competitions and demonstrations, we have never used a HiLift for anything other than lifting. However, we are in the business of carrying equipment that possesses dual purposes and will more than likely stick to the HiLift. Having said that, we definitely wouldn't "kick her out of bed" ie... the ARB "Jack"... if we were to get our hands on one. In thirty-plus years of off-road misadventures and mistakes, I have used a highlift exactly one time for recovery. And it would have worked . . . if it weren't for the lions. The Hi-Lift can also be used for fighting off lions. The ARB Jack, being lighter and shorter, is not as effective for this.